Bettina Dolinsek was born blind, but she never asked to be treated differently. That same attitude carries over into her CrossFit training, and she doesn’t shy away from movements—even box jumps. So Dolinsek started CrossFit and recently attended the Level 1 Seminar at NorCal CrossFit in San Jose, Calif.
All told, Dolinsek has lost 50 lb. And she can jump on a 30-inch box. But her coach and co-worker, Randy Landgrebe, said there’s been a transformation in more than just her physical appearance. Video by Adam Cline and Tyson Oldroyd. Additional reading: Truly Special Populations by Josh MacDonald, published Aug. 15, 2010. “Right now, like, I love my life. I do. I am so fortunate and so grateful for everything I have,” says Tanya Wagner. In this episode of Killing the Fat Man—called “Embracing It Forever”—Roberts is finishing his Level 1 seminar in Oahu, Hawaii. “If you focus on a big idea and a big goal, you can make it happen through small, actionable steps,” says Jessie O’Brien of Westlake CrossFit in Austin, Texas. I LOVE this article and the tenacity that Bettina displays in her CrossFit journey! The only thing I would change about this piece is the title. She isn't a "blind athlete." She's an athlete... that happens to be blind! 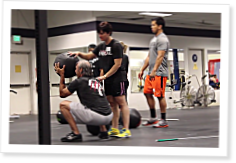 Thank you for publishing this article and video on the transformative powers of CrossFit!! Great article! Very motivational. One of the main reasons I love CrossFit: as Bettina said, it´s for everyone who is willing to show up and work hard! Well done, Bettina, you´re an inspiration for all!